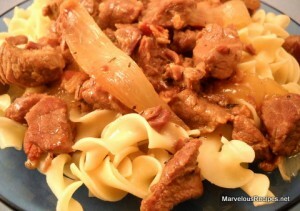 Delicious tender beef in a rich savory sauce served over hot cooked noodles! Who could ask for anything more? In a large skillet, cook the bacon over medium heat until crisp; drain on paper towels. Sprinkle the beef with pepper and salt. Brown the beef on all sides in the drippings in the same skillet. Transfer the browned beef to a 5-quart slow cooker. Add the bacon, onion, garlic and bay leaf. In a small bowl, combine the broth, soy sauce, Worcestershire sauce and thyme. Pour over the beef mixture. Cover and cook on Low for 5-1/2 to 6 hours or until the beef is tender. In a small bowl, combine the flour and water until smooth. Gradually stir into juices in slow cooker. Cover and cook on High for 30 minutes longer or until thickened. Discard bay leaf and serve over hot cooked noodles. Makes 8 servings. My daughter’s name is Emily…it’s such a beautiful name:) Thanks so much for posting to Crock Pot Wednesday. I hope you will join me again next week. Thanks again.